A regular bus service connects the airport to the city of Derry where there is a train station. There are bus and rail service to the Republic of Ireland. Taxis are available with the 20 minute journey to the city centre costing around 12 pounds. 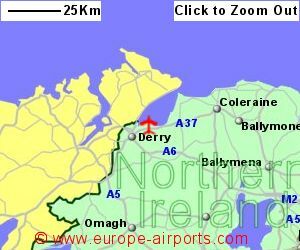 The city of Derry airport has 2 cafes/bars/restaurants and 3 shops, a bureau de change and conference facilities, and FREE WiFi Internet access. 193,000 passengers passed through the City of Derry airport in 2017, a drop of 33% from the previous year, and well below the 439,000 figure reached in 2008. 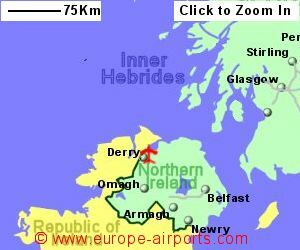 Sorry but we do not have any details of flights from City of Derry Airport to the rest of Europe.